Mar 08, 2017: Will I need an external power supply? Mar 09, 2017: Is it ok to use an external hdd with PS4 PRO that gets power through the USB cable only? Mar 12, 2017: Help deciding between 2 SSD's and 2 HDD's. Mar 12, 2017: Help deciding between 2 HDD's. Mar 12, 2017: WD 4TB Black My Passport or the WD 4TB My Book? Aug 30, 2017: $99.9 Western Digital 4TB My Passport External Hard Drive USB 3.0 --If you're looking to expand storage space on your PS4 , this is a great option. Nov 01, 2017: Brand new WD My Passport 4TB failed in two months! Dec 23, 2017: Finally backing up my data. Please advise! Jan 08, 2018: Running Steam games from external HDD using Bootcamp on internal SSD, does the SSD make a difference? Jan 18, 2018: Looking to buy an external hard drive, need suggestions! Jan 26, 2018: I bought an external SSD for pubg and it makes it way better! Feb 17, 2018: Does writing/downloading directly to an external hard drive reduce it's health? May 13, 2018: Which HDD should I buy ? Sep 27, 2018: Get ready to clear up some space on those hard drives,. 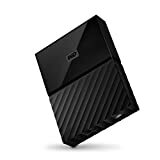 Jan 01, 2019: Need help finding budget friendly external hard drive for 4k video storage. Mar 23, 2019: Which of these external HDD would be better for me? Apr 20, 2019: Cannot access my external 4tb storage unless it's on read-only. Problem arose after the drive was suddenly disconnected while running a zero-filling program.